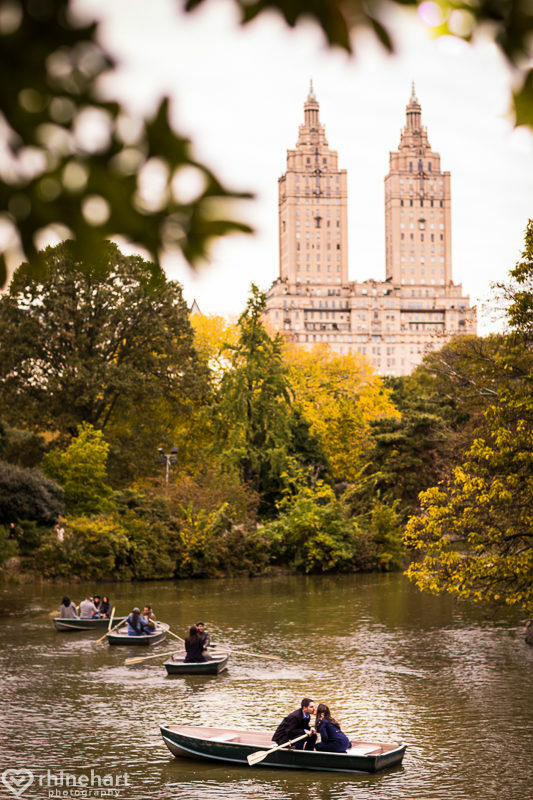 Central Park in a row boat for two– does it get more romantic than this? Nicole shared, “I was first introduced to you when I was a bridesmaid in my friend, Stephanie’s wedding. You were so fun and easy to work with and all the photos were absolutely amazing, and I remembered how effortless it felt taking those pictures the day of the wedding. All of us felt relaxed and comfortable, and getting to see the end results made me think of you as soon as Tim and I got engaged. Seeing how you captured the beauty and romance of Steph’s day made her an easy choice when it came to our own wedding. Well I don’t know how ordinary this scene is haha, but I think it absolutely is magical. Here I peer through a detail in the bridge as Nicole and Tim try to figure out how to get from point A to B, laughing all the way, haha. My first experience here was with my husband, we had seen Hamilton the musical a few years ago when it just came out and went on the row boats in central park as part of that outing. I thought it was super romantic and thought that it would be an ideal spot for an engagement session and Nicole and Tim were the perfect couple for it with their backgrounds. Talk about dramatic light, wowza!!! Nicole shared, “I first fell for Tim because of how disarming his personality was. Tim was super easy to talk to, and to this day, he’s still one of the most approachable and friendly people I know. It’s an ongoing joke among my friends, that when someone says “Even TIM wouldn’t have liked this person”, it means a lot. Their first official date included brunch and an NFL game! Bethesda Terrace is so beautiful! Reflections are another element that fascinates me– it adds this fantasy element, I think what Tim is referring to as magical, and with the setting sun, I just love this…. Nicole and Tim, thank you so much for entrusting me to capture such a special time and place for the two of you! It was such a pleasure to work with you two again and I can’t wait to be a part of your upcoming wedding at The Marigold.